I never knew my grandfather - my dad's dad. At least not until I was in high school, and he suddenly appeared in our lives. My grandfather was not a man of honor. He was an alcoholic who left my grandmother, my aunt and my dad when my dad was a very small child. He walked away from the family that he had created, never to see them again. He remarried and had no contact with my dad or his sister. Grandma also remarried, this time to a crazy man. Literally. He used dynamite to unplug household drains and thought nothing of flinging small children across the room hard enough to make them stop crying. This man was not a man of honor. My dad grew up, in spite of the rocky road of his youth, met the Lord and started down the narrow path to become a man of honor. He didn't have anyone to show him the way. He stumbled, he fell. He got back up and fought on. He knew who he served and who God intended for him to be. Rocky was the way and narrow the path, but my dad persevered. When I was about sixteen, my dad chose a path that would forever become etched in my memory. He became a man that I would choose to follow and honor. He showed me who my Father in heaven was, through his unwarranted mercy and grace. My father became a man of honor. My grandfather, my dad's dad, became ill. His wife had just died and he found out he had cancer and suddenly he was faced with his own mortality. After years of stubborn resistance to anything that resembled family, my grandfather wanted to know his son. He wanted the family that he had abandon. He wanted to know the love and acceptance of a son for his father. He wanted what he didn't deserve. My dad, who had never known the love of a father, looked to our perfect Father in Heaven for direction. He knew that God told us to honor our father and mother. And so he did. He opened our home, our lives and our hearts to a grandfather we didn't know. He loved his father, undeservedly. He taught my brother and I to honor our parents, whether they were honorable or not. He taught us forgiveness, grace and mercy. 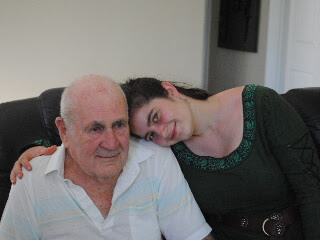 When I was sixteen, I met my grandfather. I had the honor of loving him, knowing him and spending time with him during the final months of his life. I saw a man who didn't deserve the love of his son blossom with the love of a family. But more than anything, I beheld, before my eyes, a man of honor. My father. To all of the men of honor in my life - my dad, my husband, my grandfather - I love you. God has blessed me richly with each one of you. I am blessed beyond measure. And my sons will know what it is to be a man of honor. Beautiful! To all the Earthly Father's, Have a Blessed Father's Day! What a lovely tribute to the men in your life on this Father's Day. Happy Father's Day to all the good, honorable dads out there. To my own dad and my granddads who are in heaven - be seeing you again some day. I have some work to do in a similarly off-kilter relationship. Thank you for reminding all of us of the mutual fruit of honor. It's not unlike forgiveness, in that it offers Grace for all concerned. I can tell you from experience that many people have their demons. For some it is alcohol or other chemicals. But for many it is a mental illness that they rarely recognize and cannot cope with. I know people who would have been placed in mental institutions years ago who are fending for themselves or worse spouses and parents making misery for others. I am not trying to criticize those with problems but hopefully pointing out that not everyone is "normal" or makes normal choices. One last point: Sometimes it is the "normal" one in a relationship who leaves. Sometime it is the one who stays and who appears sympathetic who is fighting demons. When a marriage breaks up and one leaves and the other stays, no one outside that relationship can know who was wrong and who was right. Maybe both were wrong, maybe neither. One thing for sure, people will choose sides and blame one or the other. Thank you for sharing this! It was a pleasure to read.